Per the service rep- it is a closed loop electrical system and you cant just unplug it. In my head...and that's a dangerous place...much like a wall outlet, or even your electric dryer outlet there is power going to the outlet at all times, that's why the make little safety plugs for outlets so kids wont stick a fork in them. And speaking of a fork, stick a fork in me, I am done, with the iMiev. Best of luck to all of you, and thanks for letting me be a part of your community. Evie wrote: when I charged the car that morning it was for only about 4 hours, went from 17 to 30 on the guessometer. Is the problem also with (or only with) the traction battery? When we first bought our iMiev, it only charged to 32. Prior to buying it, the dealer checked the traction battery and replaced it with a new traction battery as a condition of our purchase. 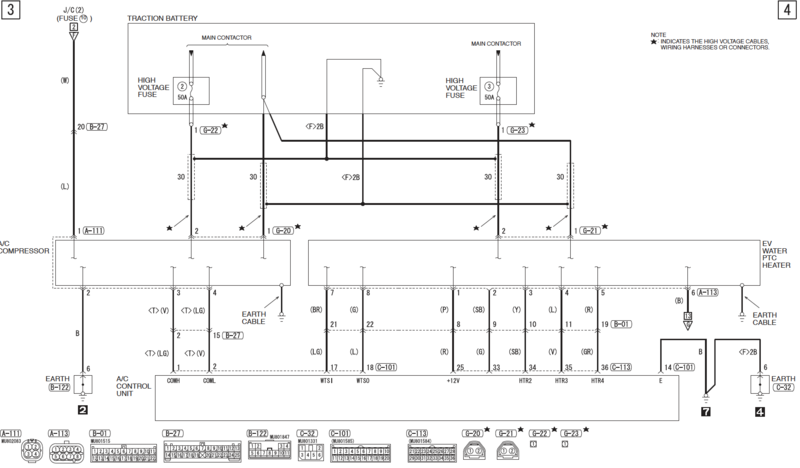 Sorry to hear you want to give up, here is a diagram showing the AC electrical stuff. Connector G20 could easily be disconnected and left off, it would be as you said just like an electrical outlet in your house--just put some tape over the end if anyone is worried about the little kids. One other thing, almost too obvious, but there is a 50A fuse inline to the AC from the pack--surely they checked to see if the fuse was blown? It can be accessed for change with the car on a lift. If the AC plug were to be disconnected and the car would run, then it would be a big selling point in your favor. My guess is that there are capacitors within the AC inverter that have failed or are leaky. Not something a wrench mechanic could repair, but an electrical technician could easily replace. i'll try to find a used one and take it apart to trace a schematic. i agree that it could be a battery pack issue and would be a warranty replacement. Surely they tried charging the pack with a Level 1 EVSE to see if it went to the full 16 bars on the fuel gauge? If not they should. If it charges up to full, then that is another selling point in your favor. If it doesn't charge up, then they owe you a new pack under warranty. kiev wrote: One other thing, almost too obvious, but there is a 50A fuse inline to the AC from the pack--surely they checked to see if the fuse was blown? It can be accessed for change with the car on a lift. Just a question regarding the fuse so that I might better understand the operation. What would be the difference of disconnecting the AC or removing the 50A fuse or having a blown 50A fuse? If the fuse is missing or blown, then no HV would be present outside of the pack on the (+) wire of the G20 connector that runs to the A/C compressor/inverter. If the G20 is just disconnected from the inverter but the fuse was present and intact, then HV would be present outside the pack in the (+) socket of the G20 connector whenever the Main (+) Contactor was energized, i.e. during charging and when in READY. Your information made it easier for me to interpret the schematic that you had posted. Did you ever get this fixed? Or sell the car? After reading about charger failures and other issues, I am considering finding a parts car sooner than later, "just in case"
see what errors will show the program of your car. The compressor can be bought on a metal detector and replaced, it's easy. Gorfllub wrote: After reading about charger failures and other issues, I am considering finding a parts car sooner than later, "just in case"
I would be super happy to buy a spare and have no problems! Not so happy to not buy a spare and run into trouble. In Canada, I'm out west. These are few and far between out here. Lots out east, but that comes with a major shipping bill. Probably less expensive to find one from the USA.